There are multiple ways to give toward the support of an EMU missionary or ministry. You can give to EMU conveniently using any major credit card. You may set up a one-time or a recurring gift. If your preference is mailing a check, make it out to EMU and mail to the EMU Home Office (address below). OR, have your bank mail a check to the EMU Home Office directly from your account (usually called Online Bill Pay at your bank’s website). Be sure to designate the missionary or project that you desire your gift support. 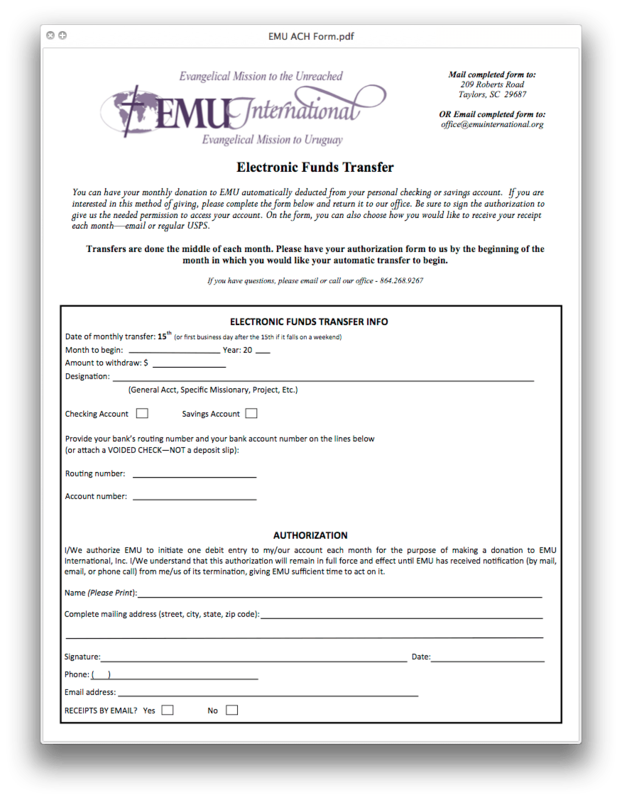 With your authorization, EMU will draft your bank account once each month for your donation. Click the image below to download the PDF form. Complete the form and return it to our office by email or USPS. OR, call our office and we can get the needed information from you over the phone.